Free parking permits for town centre workers and a four-hour limit for shoppers have been suggested as a solution for Wetherby’s Wilderness car park. Wetherby Lib Dems have outlined other proposals including more buses, in response to Leeds City Council’s plans to introduce charges at the main site, revealed last month. 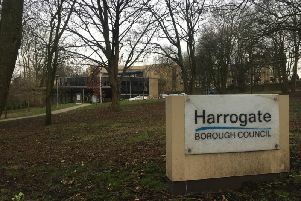 David Hopps, Wetherby Lib Dems spokesman, said: “Everybody knows that town centres are facing a struggle for survival and introducing short-term parking charges in outlying areas for the first time ever would make matters worse. “Wetherby is not just a cash cow to serve Leeds’ needs. It highlighted Wetherby’s major car park as one of three in Leeds being capable of generating £200,000 through pay and display. Mr Hopps added: “How much longer will Wetherby suffer a raw deal on transport from Leeds City Council’s ruling Labour group? Wetherby Lib Dems said they recognised the problem with the Wilderness car park being used by commuters. Mr Hopps added: “The situation in the Wilderness car park is far from straightforward. “Many locals know there is a problem in the Wilderness car park because it is filled early in the morning by commuters - primarily into Leeds. By keeping cars out of city centres they are reducing pollution levels. The party claims that Leeds City Council’s pay-and-display “threat” follows another transport snub for Wetherby in 2018 when it did not receive any of the £174m extra being spent across Leeds - with a focus on extra bus services - as part of the Leeds Transport Plan. * A York Circular bus, connecting Wetherby, York, Tadcaster, Boston Spa and surrounding villages. But Wetherby Ward members - Councillors Alan Lamb, Gerald Wilkinson and Norma Harrington - said they were still opposed to charges being imposed. In a joint statement to the Wetherby News they said: “We will not change our position on the imposition of these charges at the Wilderness car park in Wetherby - we are still vehemently opposed to this proposal. “We have met with council officers at the highest level, including the chief executive. We will be meeting with the executive member on the council responsible for this proposal, to ensure they are aware of our views and the detrimental effect on Wetherby this is highly likely to have. “It demonstrates a clear lack of knowledge of the outlying areas of Leeds. Wetherby MP Alec Shelbrooke last month told the Wetherby News that Wetherby is “crying out” for extra parking to support its thriving high street. And residents and traders reacted angrily to the proposals on the local media company’s facebook page. Mr Shelbrooke last month warned: “Free parking has proved successful for our market town, bringing shoppers in and, in return, generating business rates. Mr Shelbrooke said he feared that the City Council could move on to charge for parking in the The Cluster of Nuts, Linton Road and St James Street car parks.